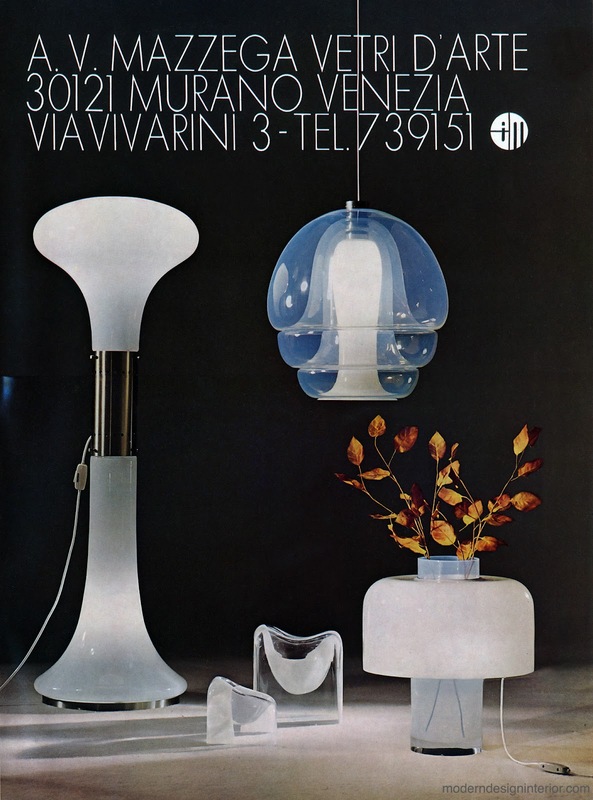 From the archives of nova68.com we bring you this beautiful image from the late 1960s; these fabulous space age glass lamps were designed by Italian glass artist Carlo Nason and were made by AV Mazzega in Murano Italy. Often incorrectly attributed to Mazzega (which is from the same family but an entirely different company). Originally released in 1969 in a variety of shapes and colors (there are some knock offs from Germany released during the same period), the classic white editions are by far the most collectible. AV Mazzega brought some of them back in the late 1990's through Spazia in a limited edition of 200 pieces. Unfortunately they are now all sold out. AV Mazzega is no longer producing them either since their master glass blower retired a few years ago. Due to the complexity and artistry required, AV Mazzega has been unable to replace him so these lamps are now highly collectible.